Congratulations to all students who participated in the 2018 National History Challenge. Participants really embraced the theme of “Turning Points” and utilised a range of medium to present their research. 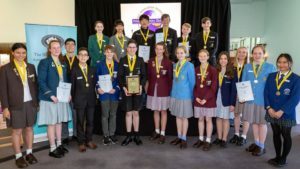 The national winners for all categories attended a ceremony at Parliament House in Canberra as well as participating in an educational programme that involved visits to a number of our sponsors. The complete list of winners for each category for each state and territory as well as the national winners can be found on the NHC website.